Back in August, Google launched its Knowledge Graph product on Search. It’s essentially a sidebar that provides direct contextual information about searches for people, places or things. 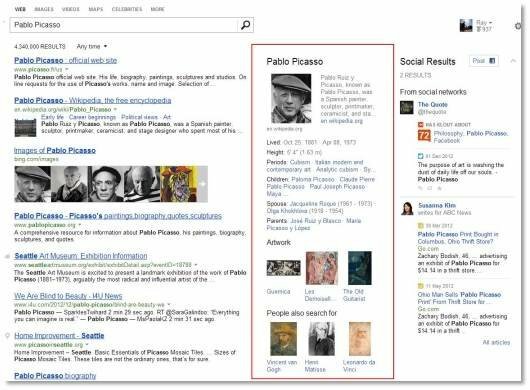 Now, Microsoft has announced that its Bing snapshot sidebar is also adding direct results for famous people and places. 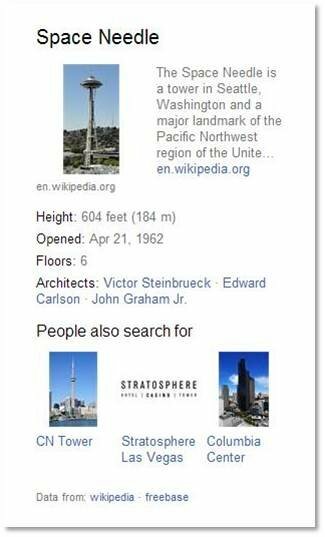 In fact, if you look at the image provided by the Bing team, you’d be forgiven if you thought it was a screenshot of Knowledge Graph in action. The snapshot bar, part of Bing’s 3-column search product, will show you relevant facts about a person or place without having to click a link. The snapshot has been around a while, but now provides even more contextual information about people and places. Searching will return things like movie trailers, albums and related people. Places will give you structural or historical facts about buildings and more. Of course, the sidebar in Google searches is just the exposed tip of the Knowledge Graph iceberg, but it is a well-displayed one, and Microsoft is making sure that people know it has that information as well. But it also has a flipside. For every piece of information that Google gives you directly, you’re not visiting a site that is indexed by Google. For now, the demos that Google is showing off appear to be truly time-saving, and don’t dip into what most would consider editorial content. They’re facts and figures, locations, family members, relationships generated by common interest or field of endeavor. Boring stuff. Now, Google has shown that it is willing to play the same card on a larger scale, delivering information without forwarding users along. Google has begun the disintermediation of the web, but it’s starting small. Where it goes from here will be interesting. Since the original introduction of Knowledge Graph, Google has expanded it by adding concert info, medication, exposing more about how it makes connections and integrating it into Google Now. Bing says that it will be expanding the snapshot bar as well. Sounds about right.